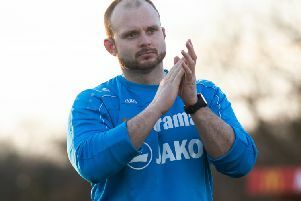 Hemel Town boss Dean Brennan says he is looking to start rebuilding for next season after seeing his side beaten 3-0 at home by Bath City in yesterday’s Conference South clash at Vauxhall Road. The Tudors were far from their best, and never looked like taking anything from the game once right-back Dave King had been sent off early in the second half for a petulant headbutt. And Brennan admitted that Bath were good value for the three points. “The better team won the game,” he said. “Full credit to Bath, they came here and set their stall out, they worked harder than us and they wanted it more than us. Brennan was, however, left frustrated by a number of refereeing decisions which went against the Tudors – not least in the build-up to Bath’s opening goal. “The linesman put his flag up for a foul, but the referee didn’t give it,” said the Hemel boss. “What can you say about referees, though? It’s a tough job but we’ve had no breaks at all in this league. All in all the better team won and I have no qualms about it, we were poor. Despite his side’s lacklustre display, Brennan insists the Tudors will move on quickly and look towards a strong finish to the season. “It’s just on to the next game now,” he said. “Mathematically we can still reach those points we need to make the playoffs but we will give some young lads a chance now and we will start looking to rebuild for next year.